The publication of the fifteen-year correspondence of two of the titans of weird fiction, H. P. Lovecraft (1890–1937) and Clark Ashton Smith (1893–1961), is a landmark event. This mammoth volume, containing 330 letters written between 1922 and 1937, allows an unprecedented glimpse into the lives, minds, and creative instincts of two brilliant writers who lived a continent apart and never met, but who shared a fascination with the weird and the cosmic and had the highest regard for each other’s work. Lovecraft initiated the correspondence by writing a fan letter to Smith, who in 1922 was already an established poet. A warm exchange of views ensued; and as Lovecraft gained early success in Weird Tales, he urged Smith to send his poetry to the magazine. Smith, meanwhile, repeatedly read Lovecraft’s stories in manuscript, and by the late 1920s he himself had begun to write tales of fantasy and science fiction that found ready acceptance in the pulp magazines of the day. But the two authors were far more than pulp fictioneers. They held profound and at times conflicting views on the nature and purpose of weird fiction: Lovecraft admitted that he was a “prose realist,” whereas Smith claimed that “I am far happier when I can create everything in a story.” Their discussions on the theory of the weird tale are some of the most illuminating pages in this book. Smith and Lovecraft shared many mutual acquaintances—Donald Wandrei, August Derleth, Robert E. Howard, R. H. Barlow, among others. Their accounts of meeting these and other colleagues, and their responses to other historical and cultural events of their time, present a fascinating window into the culture of the 1920s and 1930s. The volume—the result of decades of research in accumulating and annotating the letters—has been meticulously edited by David E. Schultz and S. T. Joshi, two of the leading authorities on Lovecraft. Aside from an introduction and exhaustive notes, the editors have included in an appendix an array of additional documents that shed light on the Smith-Lovecraft relationship, including the complete “Boiling Point” letter column from the Fantasy Fan. David E. Schultz is the editor of Lovecraft’s Commonplace Book (1987) and an exhaustive annotated edition of Lovecraft’s Fungi from Yuggoth (2017), along with many editions of Lovecraft’s letters. S. T. Joshi is the author of I Am Providence: The Life and Times of H. P. Lovecraft (2010), Unutterable Horror: A History of Supernatural Fiction (2012), and other critical and biographical studies. He has edited Lovecraft’s collected fiction, essays, and poetry. 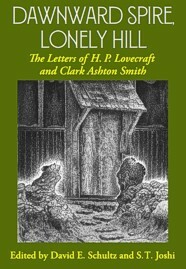 Dawnward Spire, Lonely Hill: The Letters of H. P. Lovecraft and Clark Ashton Smith. By H. P. Lovecraft and Clark Ashton Smith, Edited by David E. Schultz and S. T. Joshi. New York, NY: Hippocampus Press; 2017; ISBN 978-1-61498-174-9; hardback, 800 pages.